Because of the lack of such specialists as linguists and translators in Jalal-Abad Oblast, Ph.D., associate professor Satybaldieva GA Became the initiator who offered to open the corresponding specialties. In the academic year 2011-2012, such a specialty as translation and translation studies was founded and 22 students were enrolled. So the Department of Translation, Translation Studies and German Language was opened, where G. Satybaldieva started her teaching activity. And senior teacher Osmonova K.
In 2012-2013 academic year, 20 students were enrolled, in whose education the senior teachers Myrzakulova K., Toromamatova M., Kerimberdieva A., and the teachers Asilova N., Koychukulova Zh., And Kasymova N.
In 2013, on the basis of the decision taken at the seventh meeting of the Academic Council, order No. 183 of July 6, 2013, the foreign language department was disbanded, its faculty was joined to the Department of Linguistics, where the number of teachers reached 15, of which 1 candidate of science , Senior lecturer, 8 senior lecturers, 4 teachers, 2 trainee teachers and 1 head of the cabinet. 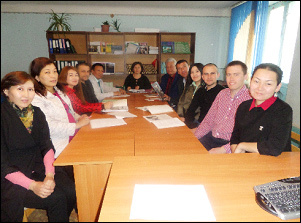 Senior teachers of the chair of Zholdoshbayev Y., Abdykalykov Ch. And Ergashev D. prepared their thesis for defense. Trainee-teacher N.T. Turdalieva studies in graduate school and works on her thesis. Other senior teachers Oskonbaeva S., Asylbekova D., Kushbakova C. ,, N. Turdalieva and R. Emilbekova conduct teaching and methodological work to help young teachers in the application of innovative teaching methods. In connection with the heavy workload in the amount of 19.5 rates, the Department of Intercultural Communication and Linguistics separated the inter-faculty department of the English language with 11 members, the remaining 14 teachers remained at the old chair. The department closely works with other higher education institutions of Kyrgyzstan and universities of such countries as Kazakhstan, the USA, Russia, and Germany. Such works of teachers of the department as 1 monograph, 2 teaching aids, 82 scientific articles and 14 educational-methodical complexes were published. At present, the staff of the department works on specialty over syllabuses and educational-methodical complexes. 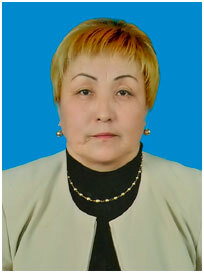 Ph.D., associate professor Satybaldieva GA, being the coordinator of the Association of English Language Teachers of Kyrgyzstan “Forum” in Jalal-Abad Oblast, along with teachers of the English language, she constantly organizes trainings and seminars on improving the teaching of a foreign language using innovative teaching methods . The teaching staff of the Chair of Intercultural Communication and Linguistics, being a member of the “Forum”, take an active part in all trainings and seminars and apply the acquired new skills and abilities in their teaching activities. Also, the faculty of the faculty as a member of the association “American Studies” participates in symposia held annually by the American embassy, ​​and implements the acquired knowledge in the training of students. In a word, teachers of the department take an active part in various trainings and seminars and become holders of diplomas, certificates and certificates.